I am pleased to publish the inaugural column for Hortoise (rhymes with Heloise) who, like Hortense Hoelove, is a garden columnist. Hortoise focuses on the practical side of gardening, offering trips and tricks to make gardening easier and more enjoyable for everyone. I'm living through an extreme drought and find that my rain gauge is not getting much use. It just sits in the garden day after day not fulfilling its primary purpose, measuring rain. I think it is so out of practice that it is no longer accurate. The one time we had some rain about a week ago, I couldn't trust it because I think it might have had some water left in it from my hand watering nearby shrubs. Is there anything else I can use my rain gauge for? Thank you for your well-timed question. As you know, I am a strong believer in keeping only those things that we find useful and making good use of what we have. We need to make your rain gauges useful again! In that spirit, I've come with some alternative uses for your rain gauge to ensure it continues to be useful until you get some rain, hopefully soon. In no particular order, here are ten alternative uses for rain gauges. A vase to hold fresh flowers. This is particularly useful if your garden has few fresh flower in it due to the drought. A dried flower holder. If you are concerned about keeping water in the rain gauge, dried flowers and twigs may be substituted for fresh flowers. Please note that in extreme drought situations, the surrounding garden should be considered highly flammable. Never actually light the candle, especially if it is precariously resting on top of the rain gauge. An LED tea light holder. If you want the look of a flame without the danger of open fire, this is a good alternative. A cutlery holder. You never know when you'll need a spoon, knife or fork to have an impromptu picnic or ward off rabbits. A drinking cup. After working around the garden, what is more refreshing than a cool drink from a rain gauge. A pencil holder. This is useful for those times when you need a pencil out in the garden. A sign holder. When the ground is as hard as concrete, the rain gauge helps to hold up the sign. A sunglasses holder. This keeps your sunglasses close by so the garden fairies can hide them in the event of sunflares. A pedestal. The rain gauge can hold up an endless number of decorative items for the garden, such as this fake bluebird. 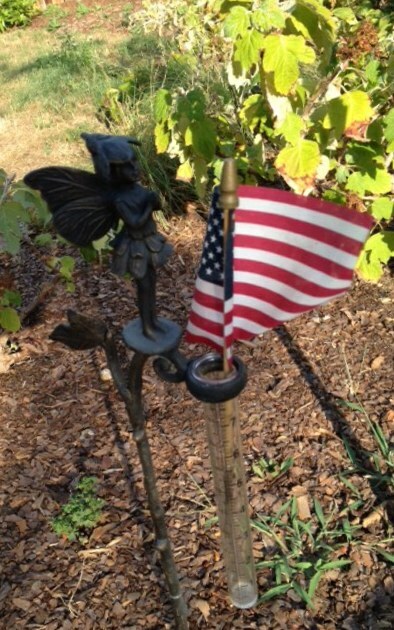 A flag holder. 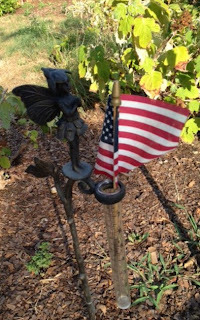 Show how patriotic you are by proudly flying the flag in your garden. I hope these ideas have spurred your creative juices. There are probably dozens of other uses for rain gauges. One final piece of advice - remember to empty the rain gauge anytime you use it as a vase or drinking cup so that it can later be used for its intended purpose, measuring the amount of rainfall on your garden. Thank you for the accompanying visual aids. They help show the practicality of the suggestions. The one with the straw seemed a bit gross but the rest are great! Very funny. You've got to laugh if you don't want to cry. I cannot quite get my tongue to pronounce your name rhyming with Heloise. Very funny nonetheless. It's good to have a sense of humor~Especially after this long, hot, dry summer. Hortoise, Thanks for including the photos along with the suggestions--great ideas:) I'm glad to know, though, that you could finally make use of your guage for its original purpose this weekend.